So, like everyone else on the planet, I’ve been hitting the gym pretty hard this January. It’s been fun to get back into exercise, and I’ve been feeling good. So good, in fact, that I hesitated to mention it here lest I drive my readership away in their throes of jealousy. Because after all that exercise (it’s been three whole weeks you guys!) I can assume but one thing: I look good. Shoot, I’d even go so far as to say I look geeood. That’s how hard I’ve been working. And it’s this thought–how good I look–that sustains me in my efforts. When my phone wakes me at 5 am and pulls me, groggy and grumpy, out of Gerard Butler’s arms (where I can always be found at 5 am), only one thought is potent enough to get me out of bed: I look good. Eyes closed, I slide off the mattress and into the closet, where my lycra and spandex await me. Pulling, pinching, and stuffing myself into the “activewear,” I tell myself (eyes still closed), “That you cannot draw breath in this sports bra, that these running tights are smashing last night’s pizza up your rib cage, that the rest of the family will now enjoy another two hours of sleep–it’s all worth it.” Why? Because I look good. Driving to the gym in the dark, I’ve no choice but to open at least one of my eyes. (Not to brag, but I’ve kind of mastered the Cyclops Driving Method this month. Hey, it’s early.) I fumble with the stereo in hopes of a station to keep me awake for the two minute drive, but find only weather forecasts and yesterday’s political rants. Early morning air time is apparently reserved for the trucking crowd because, unless it’s one’s profession, what idiot would be driving at this hour? An angry man screams at me through the speaker about things over which I have no control–something I don’t need to get up at dawn for since I can get the same treatment from my own kids at any time during the day. It’s too early to for this, I think, but it’s worth it. Why? I pull into my parking space, fumble out of the car and across the lot, and pull the heavy glass door open against the driving winter wind. Bright lights and big smiles greet me as I walk in, compelling me, at last, to open my extra eye. I cross the mat to join the Circle of the Dedicated, already warming up with quad stretches and shoulder rolls. Feeling a little more awake now, I take a deep breath and brace myself for the onslaught of exertion that awaits me. I’ll be alright, I tell myself; I’ll make it through. Why? Because on the other side of every workout, I look good. I jump, quite literally, into the circuit training, quickly panting my way into a full-board sweat. I lift, I lower, I push up, I pull down, I squat, I plank, I plie. (I think that’s what that last one was?) I work, work, work, all of it done with the smug satisfaction that, though I hover near exhaustion, I look hotfreaking good while hovering. Forty minutes into the routine, I am, at last, fully alert. My blood is pumping, my heart is racing, my face is flaming. And my brain is soaring–with all the possibilities this early morning workout holds for me. I could train for a triathlon! I jump my rope a little faster at the thought. I could climb Mt. Everest! I hold my plank position a little longer, envisioning Gerard Butler as my Sherpa. I could replace Jillian Michaels on the “Biggest Loser!” Lowering myself in a push-up, I make a silent promise to my clients to allow several more grams of carbs per day. (I’m tough, but kind.) I can do anything! my endorphins are shouting. And more importantly, I will look good doing it. The session nearly over, it was time for high-knees. Unlike the others, this last drill was executed facing the gym window; it required me to run toward the glass and back again like Jughead escaping Big Ethel. The exercise itself was not a problem–I was a rubber hose at this point and no longer felt pain–but the reflection was. The reflection was a big problem. 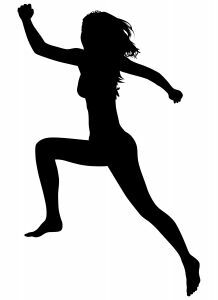 Because, you see, as I ran toward that window in my jiggling sports bra and expanding lycra, heaving my knees up as high as my thighs would take them (it was so much higher in my head! ), I encountered a new reality: I did not--did not–look good. I did not look good at all. I looked, in fact, bad. Very, very bad! Despite my three weeks (!) of intense and admirable training, I looked less like Jillian Michaels and more like a forty-year old housewife who’s had three kids and–bless her heart–is trying to to not going down without a fight. All thoughts of Gerard and I on the trail vanished, replaced by only one thought: they lied about the black lycra. It doesn’t hide anything. 2) Keep telling yourself that you look good. Age and beauty are states of mind, and it’s a good thing because, as the years go by, I’m gonna have to rely on my mind more than my mirror. And that’s okay, because in my head–if not my reflection–my frantic efforts at 5 am are paying off. In my head, I am just absolutely certain that, after all is eaten and done, I still look good. Previous Article Freud says there are no accidents. Next Article Hungry for your art.